HANOI, Vietnam (AP) — The stereotype of artists as eccentric is a common one, and the work of Vietnamese artist Tran Lam Binh seems to support that view. Since 2015 he has turned out painting after painting of Donald Trump. Many can be seen this week in Vietnam’s capital, Hanoi, where Trump is holding a summit with North Korean leader Kim Jong Un. Binh has also fashioned a statue of the American president that’s almost 2 meters (6½ feet) tall, more or less life size. Don’t assume Binh is single-minded, however. In 2017, he began diversifying his portfolio of roughly 50 depictions of Trump by painting portraits of Kim Jong Un as well. So this week is kind of a perfect storm for 36-year-old Binh with his two favorite subjects coming to his homeland to discuss peace on the Korean Peninsula. Binh said he won’t sell the portraits and instead will keep them as a souvenir of the historic event. He may not be turning a profit, but has been reaping a motherlode of publicity as the summit has brought foreign and local media in droves to see him and his work. Binh started painting Trump portraits in 2015 when the American real estate mogul launched his campaign for the presidency. After Trump’s election victory, Binh staged an exhibition of his works on a sidewalk near the White House. Binh’s style, with garish colors and casual brush strokes, somewhat recalls the paintings of Canadian comedian Jim Carrey, another Trump obsessive. Carrey’s barbed caricatures, posted on the internet, make no secret of the fact that he is a fierce critic of Trump and his politics. Binh, on the other hand, is a fan. Binh said he wants to invite Trump and Kim, “if they have time,” to visit his studio and view his work. “I will invite them for coffee and paint portraits of them and give them the paintings as a token with a message of love and peace,” he said. 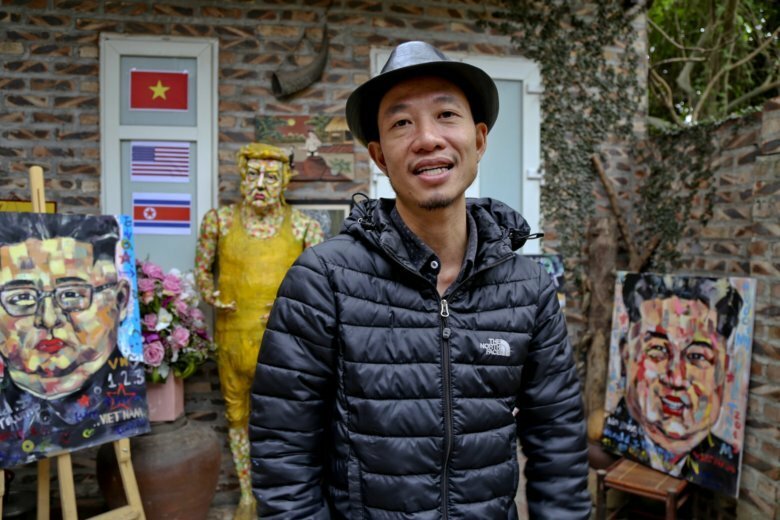 Tran Tuan Anh, the owner of the cafe where Binh’s works are being displayed, said he hopes Trump and Kim can strike a deal at their meeting in Hanoi. “With a message of peace in the city of peace, I’m very hopeful that the two leaders will achieve peace for the two countries as well as for the whole world,” he said.